Happy New Year! I hope that 2015 is successful, happy and full of good health and good times for you! We have some very exciting plans here in our house in the woods! Have I mentioned that we’re getting ready for a major kitchen renovation? It’s time. The floor in front of the fridge is so rotted, we are afraid that one of us is going to crash into the basement while getting an ice cube. This whole process has gotten me thinking again about de- and reconstruction. In the Unstuffed Cabbage post, I talked about a process of falling apart and re-organizing as a sort of organic process that happens during the course of life. And that when it does, the best thing to do is to be aware and to “go with” the process. But sometimes, demolition and reconstruction are conscious and intentional. As with a renovation. Or surgery. Psychotherapy. Altering pottery. Or cooking. In this case, I recommend planning (not worrying), care, and attention to detail. Think about it for a second. 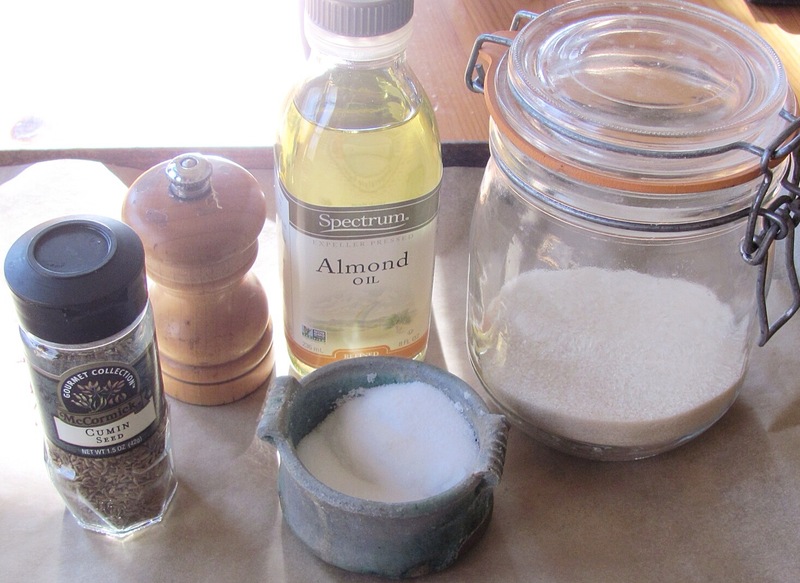 When we cook, we “break down,” our ingredients and then build something with them. We cut up apples, or zucchini, eggplant, or avocado, combine them with other ingredients, and transform them by combining, blending, and/or applying heat. The finished dish may or may not bear any resemblance to the original foods. An apple crisp doesn’t look much like an apple! 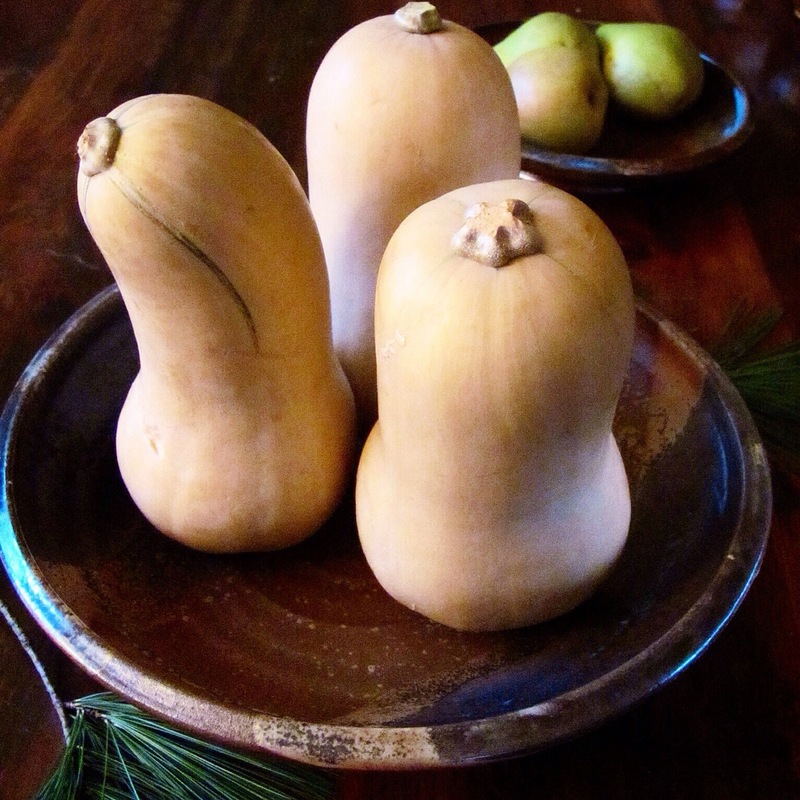 When I saw this Reconstructed Squash by Chez LaRae on her beautiful Instagram feed, I was totally charmed! I knew that creating it would be good practice for the kind of energy I am going to need to cultivate in the weeks and months ahead. 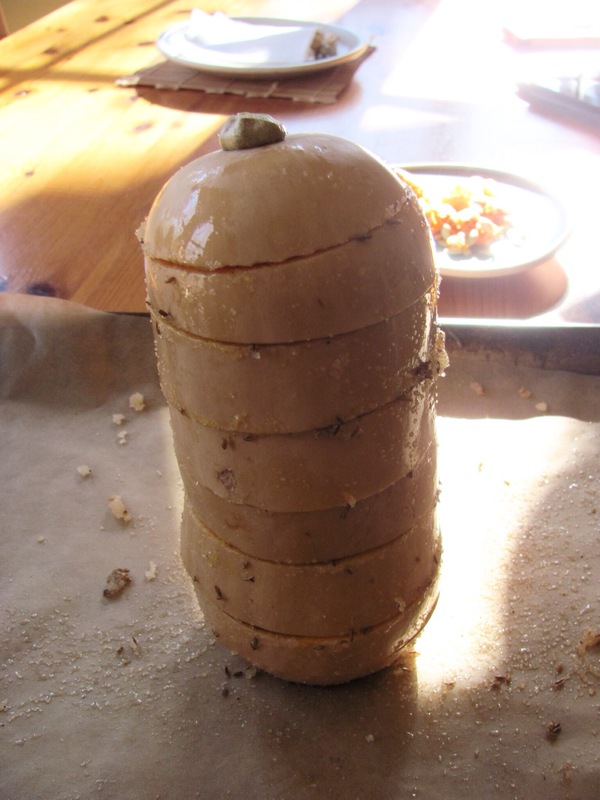 I had a pretty butternut on the old, warped counter, and I got right to work on the demolition and renovation. Of the squash. As with any good building project, I put my own spin on it…This is fun, simple, and a little goofy. Everything you could want in a food or a new room! 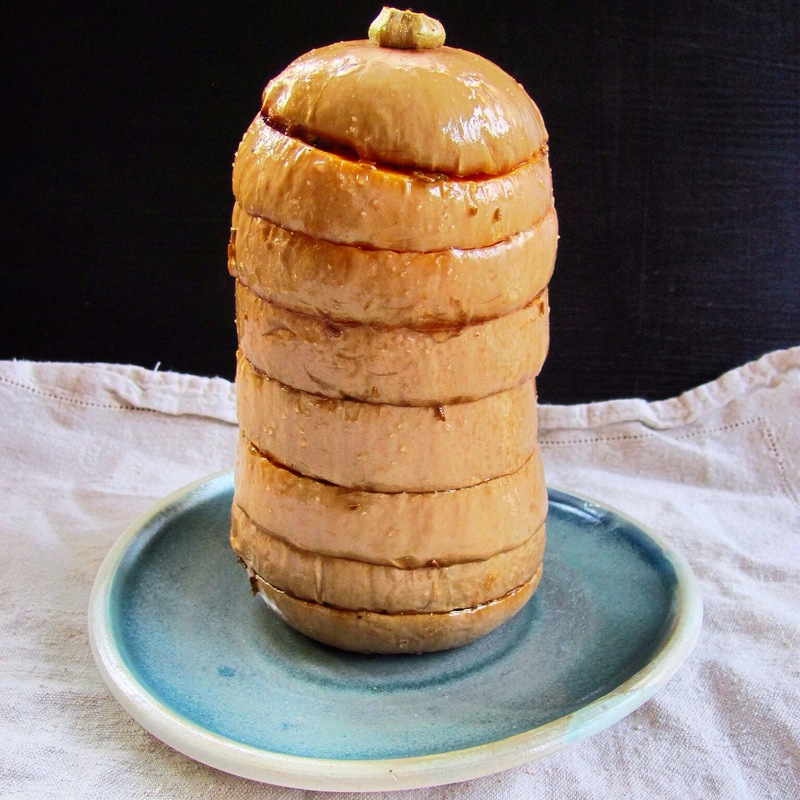 I haven’t tried it, but I see no reason you couldn’t do this with any winter squash-acorn, delicata, kobocha, or pumpkin. Oooh, wouldn’t it be cute with a bunch of those little munchkin pumpkins? Preheat the oven to 375°. Line a sheet pan with parchment. Stand the sqaush upright and see if it stands securely. If not, start by cutting a bit off the bottom to make it stable. 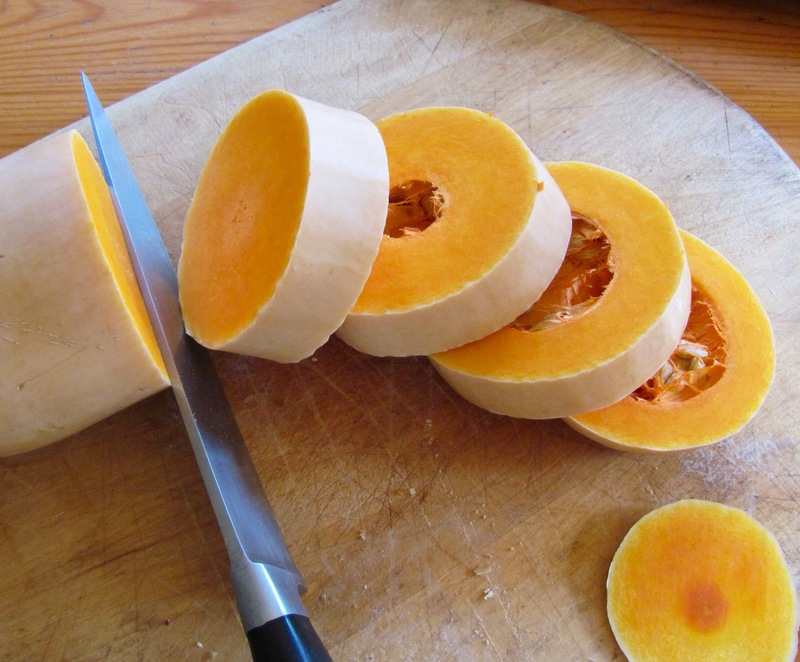 Now, cut the squash into rounds. I use a very sharp chef’s knife and a rubber mallet. Get the knife lined up where you want to make the cut and then tap with the mallet until the knife is embedded. Continue tapping until you’re through. 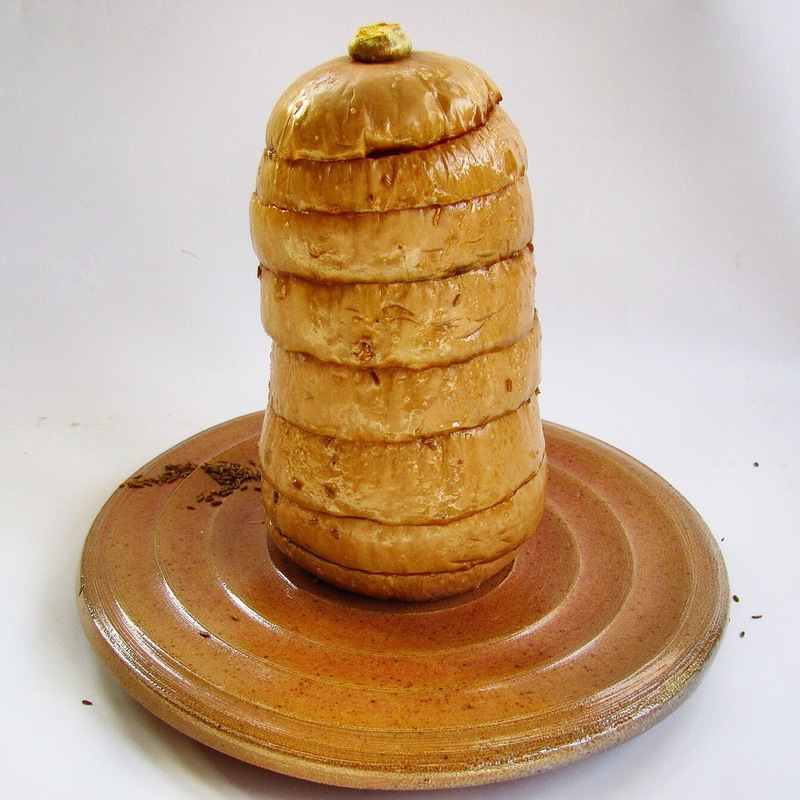 To do this tower, it’s important for your cuts to be parallel; if you mess up with one, compensate on the next one; it helps if you are a potter! Or a builder with a level. Clean out the seeds and strings from the pieces. I usually use an ice cream scoop because it has a sharp edge. But a fun way to do it is to use a series of round biscuit/cookie cutters; your pieces come out very neat but you might lose a little squash flesh if your sizes don’t match perfectly. A spoon works just fine. When I roast vegetables, I am usually lazy and don’t bother messing up a big bowl. I put the oil and seasonings right onto the parchment and then roll everything around until it’s coated. Alternatively, you can use a big bowl and you’ll get better coverage. 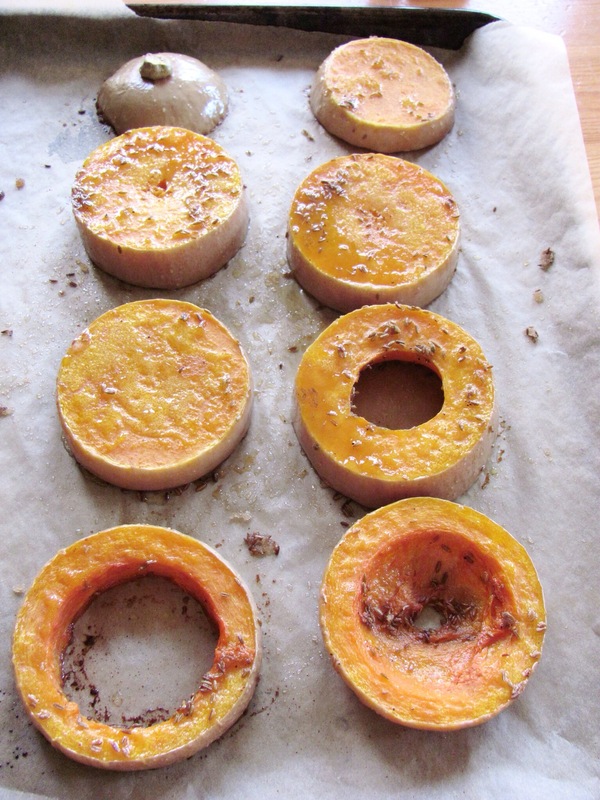 So, get the squash all lubed up and arrange the pieces on the parchment. It helps if you reassemble the slices before you cook and then lay them out in order.Roast for 25-35 minutes or until they are just tender. You want to watch pretty carefully here-it’s no fun eating raw squash, but if you overcook this, your renovation will be unsuccessful! OK, now for the fun part. 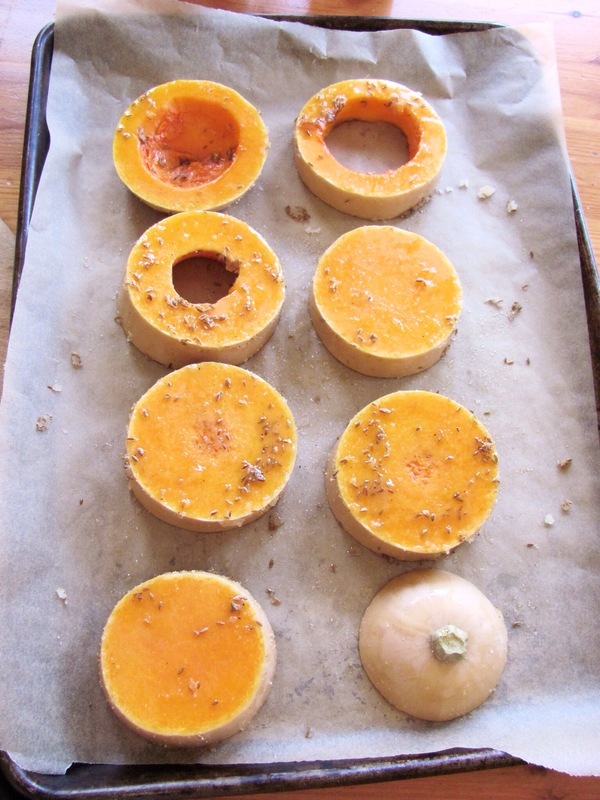 Let the squash cool for a few minutes and then reassemble it on a pretty plate, preferably one made by a potter. Notes: I love the combination of sweet and cumin in my reconstruction. LaRae used maple syrup on hers and I’m sure that was lovely! You could skip the cumin, add smoked paprika and/or cayenne…ginger or cinnamon are nice with squash…there are so many options! I made this ahead and reheated the whole construction in the microwave, intact. Butternut squash reheats really well! 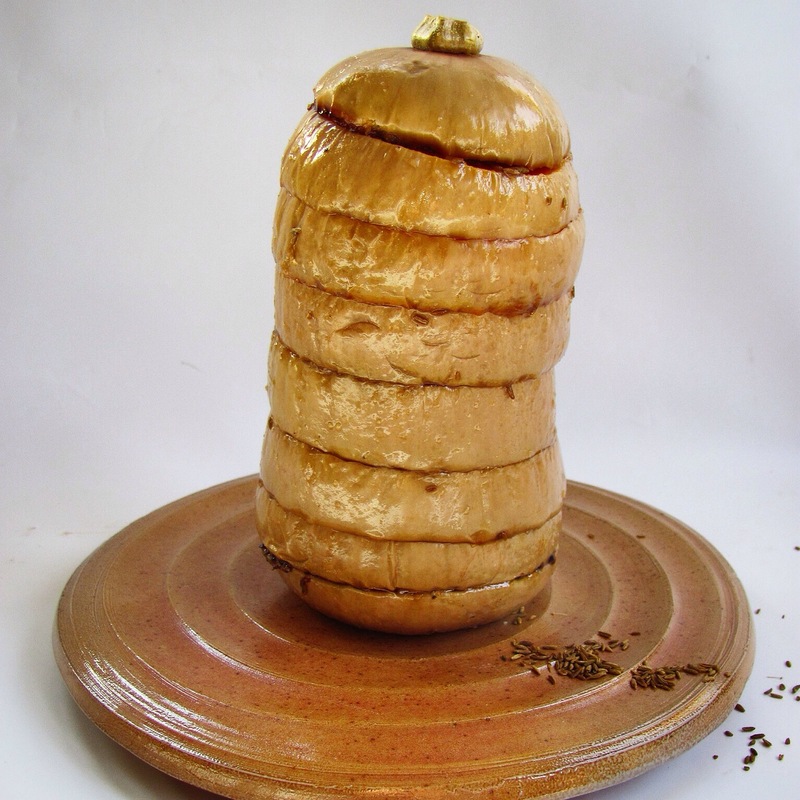 And if you’re not interested in construction, this is perfectly lovely in a bowl or on a plate. This is a great side dish for so many things: grillled or roasted poultry, meat, fish, or tofu. 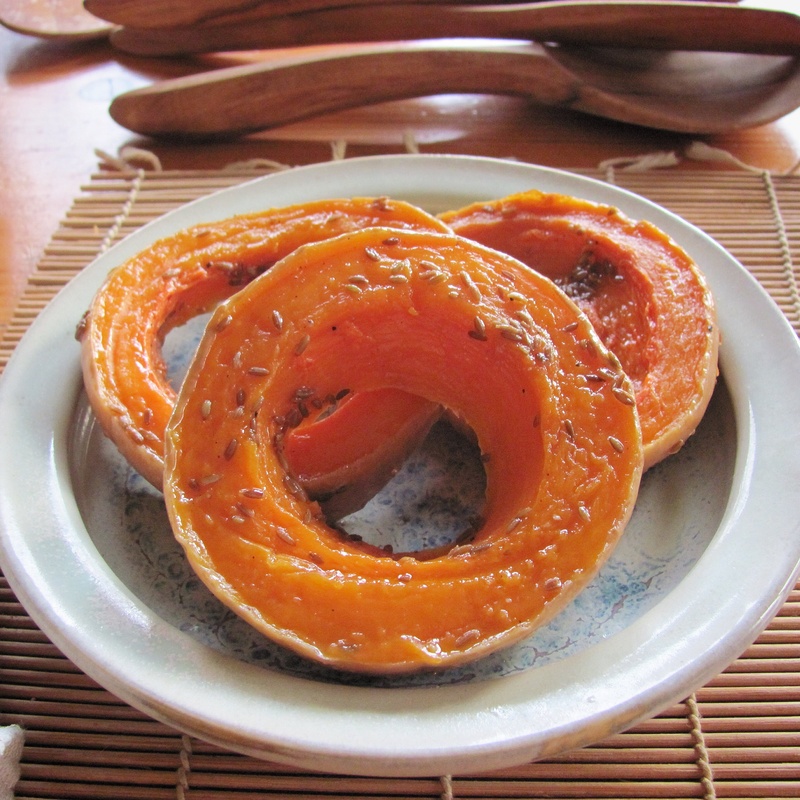 If you want to deconstruct it before serving, or you have leftovers, roasted squash is a wonderful element to add to a salad. Have fun and good luck with whatever you are renovating in 2015! 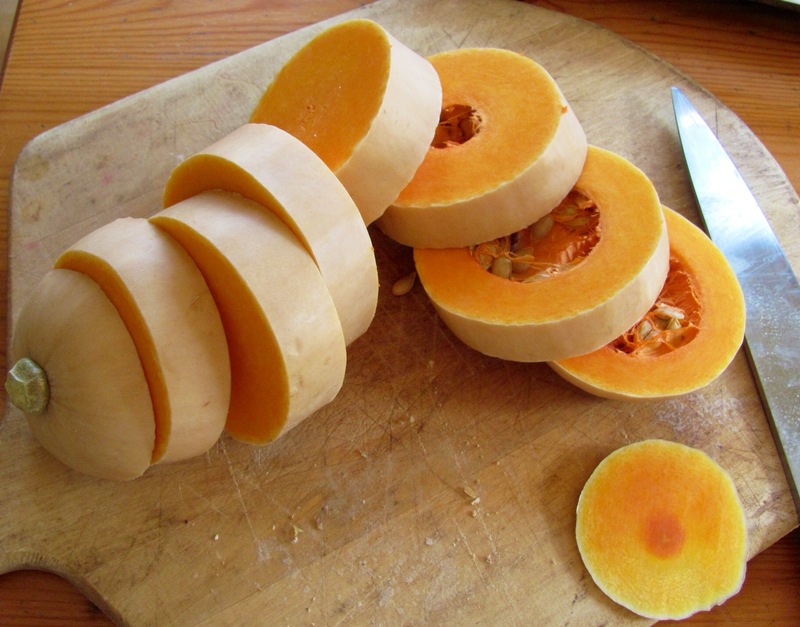 This entry was posted in side dish, supper, vegetable and tagged butternuts squash, dairy free, gluten free, paleo, side dish, squash, vegan, vegetable. Bookmark the permalink.